Discover the fascinating world of wildlife tracking! Learn to identify and interpret the tracks and signs of wild animals while gaining a new awareness of of the natural world. Wildlife tracking skills enhance outdoor experiences, are a valuable tool for wilderness survival, and can be used to contribute to wildlife research & conservation. This course covers track identification, interpreting behaviors from track patterns, and documenting tracks & sign through photography and field journals. The course is a mixture of engaging presentations and ample hands-on field practice along beautiful local rivers and forests. 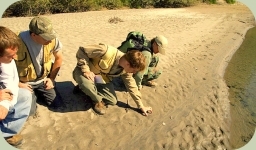 Wildlife tracking skills are an invaluable tool to both the outdoor enthusiast and environmental professional. Accurate track and sign identification skills allow you to quickly assess species present in an area. Information gathered from tracks & sign can support wildlife management and conservation efforts. "Very well rounded for a two day course. Covered a lot of basics and left me wanting more! Opened my eyes to what seems to be the obvious. Thank you!" "Great introduction to tracking. Especially liked the plaster casting and the slide show. Would definitely take another course. Great instructors!" "The course had a huge positive impact and changed the way I look at, approach, and relate to the natural world around me."